Experience the Gold Coast as you never have before! Your Ducktacular land and water tour begins with a bit of ducking and weaving around the streets of Surfers Paradise, followed by a waddle along the glorious Gold Coast beaches and up to the magnificent Versace and Marina Mirage Resorts. That's where the Aquaduck gets to show its true colours with a bit of 'duck diving' into the spectacular Broadwater and you get to experience the thrill of the big splash! Cruise along and take in the sights of the beautiful waterways and of course the fabulous millionaire's row. 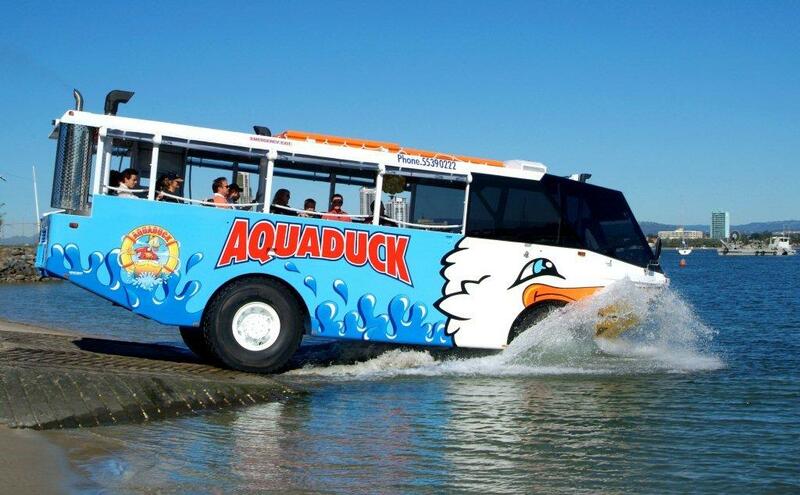 Three amphibious vehicles, which hold 30 passengers each, are part of the Aquaduck fleet. This might mean that seats can be limited, so book a trip beforehand. A tour guide will help explain all the sights, sounds and things you can do in Gold Coast as the tour takes you from the heart of Surfer's Paradise to the sand and sea. Children who are aboard the Aquaduck are given a chance to drive the amphibious vehicle on the water for a short time. They will even be awarded a certificate when they finish! The average Aquaduck tour will last up to an hour, making it a great fit with any tourist agenda. You may be offered time to see even more of the sights and sounds that Gold Coast has to offer. 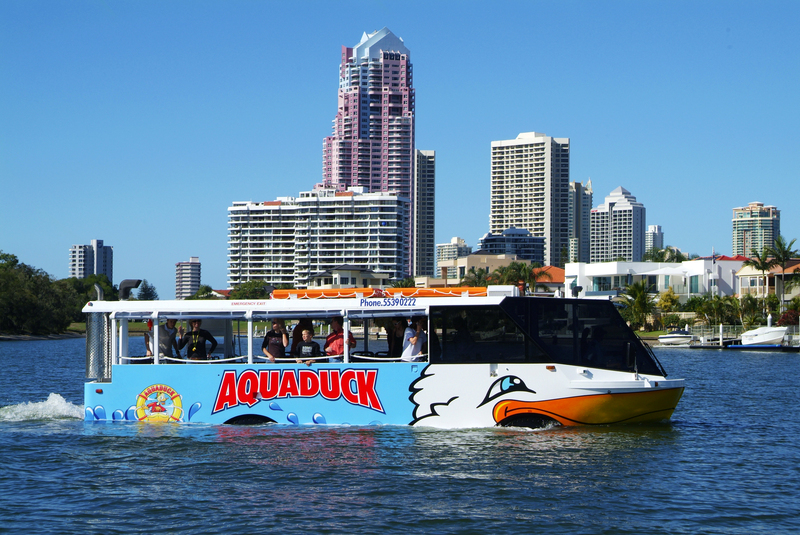 The Aquaduck will offer customers a unique way to tour the Gold Coast, whether with family or with friends. For a tourist wanting to see the best of the city and beaches on a single, centralized trip, the Aquaduck may be a great choice. A guided tour can also be great for people who are clueless about where to go while in a tourist destination. 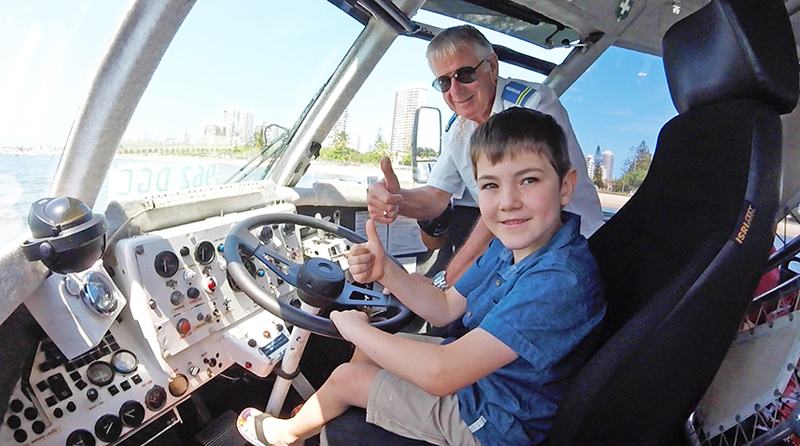 More experienced tourists may even learn a thing or two when taking a guided tour around the Gold Coast area with a guide!